Big Data is a hot topic, if you are a vendor in the Big Data market place you are probably either already running influencer programs or strongly considering it. The Big Data market place is quite complex with many vendors and a huge number of complex issues to digest and take into account. It’s a classic example where influencers, including analysts, journalists, bloggers, commentators and technical evangelists are influencing the awareness and viewpoints of prospective clients. However, if you want to run an influencer program on Big Data, how do you go about it? 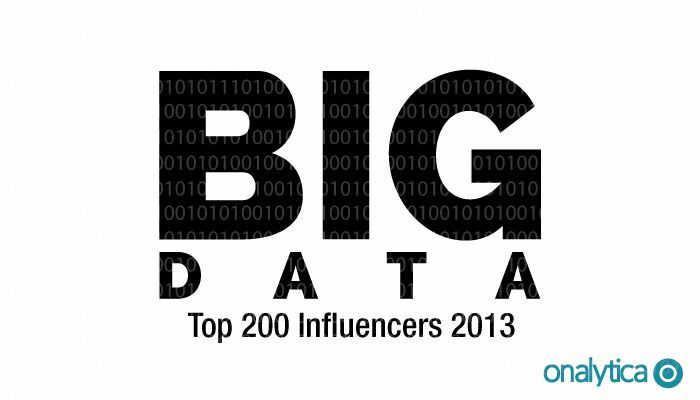 First you need to identify who are influential in the debate on Big Data. You probably already have an idea about who some of the influencers are and you may already be engaging with them – probably much in the same way as you did a decade ago. It’s likely you are only dealing with a small number of influencers, maybe only the top industry analysts. However something has changed. Today there are many more influencers participating in the discussions. Being part of the discussion is a great way to grow your personal and/or company’s brand, and because it is now so easy to join the discussion on blogs, on the WWW and on Twitter the number of participants has swelled to 100s of thousands. I fired up Onalytica IRM (Influencer Relationship Management) and took a look at who are influential in the Twitter conversations on Big Data. The top 200 (out of 125k+) are at the end of this post. However, it’s clear that there are so many influencers that building relationships with all of them doesn’t seem very scalable. Tier 1: Global/National Influencers Usually household names in the industry, these influencers make a living from being influencers. They include journalists, industry analysts, “famous” commentators and similar. If you want to build relationships with anyone in this group, it is best handled by people with substantial PR training/experience. Tier 2: Topic Thought Leaders Prime influencer engagement material. These thought leaders usually have a tech background, are often subject matter experts, but are often less hands-on today than they used to be. You want to build personal relationships with anyone in this group. Tier 3: Community Influencers Actively hands-on, these influencers are all influential in their local community and several are on a trajectory to move into Tier 2. This group also represent excellent influencer engagement material. You don’t necessarily want to build personal relationships with everyone in this group, but you do want to engage with anyone you can be helpful to or who is likely to find your influencing material such as case studies and white papers interesting enough to share with their community/followers. Tier 4: The Rest The members of this group may participate in the discussion but they usually have neither the appetite nor the expertise to move into Tier 3. Once you have identified all the influencers in your industry you can upload them to Onalytica IRM together with all your influencing material such as white papers, case studies, presentations, blog posts, etc. Onalytica IRM will then start generating great influencing opportunities – opportunities where an influencer is very likely to find one or more pieces of your influencing material highly relevant and timely. It does so by using our patent-pending content recommendation engine which, based on what influencers are saying online makes an immediate assessment of what material, if any, you have that is likely to be of high relevance and interest for the influencer – right at this moment. You can now reach out to the influencer using Twitter, email, phone or any other appropriate way with the increased conviction that follows from knowing that you are being highly relevant to them. In fact – in most cases they are likely to thank you for bringing the relevant material to their attention and in many cases they will share their “find” with others. The net effect of this solution is that your evangelists spend time on being relevant and building relationships with influencers – rather than spending time looking for opportunities to engage; and just as a sales team that works off a steady stream of hot leads performs better than one that has to find their own leads, your evangelists will help win significantly more hearts, minds and market share. Of course Onalytica IRM comes with all relevant CRM functionally for effectively recording, reporting, analysing and managing the whole influencing process built in.